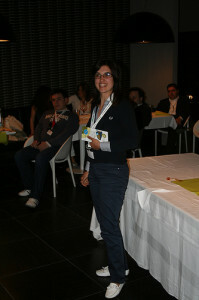 A first presentation was made by Sara Maternini who presented the idea behind GGD Italy. After this an online connection was made with Beatrice Finauro, coordinator of Marketing Fox Interactive Media and MySpace Italy who talked about Tools and potentials of social media. The next speaker was Dr. Federica Pascucci, researcher in Web marketing and social media strategies at the Università Politecnica delle Marche (Ancona) who presented a research on social medias and enterprises. As a last presentation Kylene De Angelis introduced TACCLE to the group.